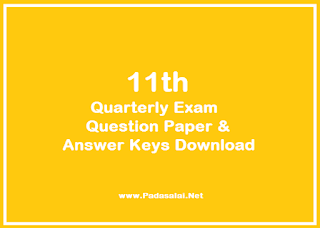 Tamilnadu Government conducts Quarterly Common Examinations every year at the end of first term - (September). Now the quarterly Examinations are conducted on the content of Samacheer Kalvi Text Books throughout Tamilnadu. These Exams will be conducted common, that means all the state board schools should follow the same question papers especially 11th Standard.